Admittedly, I’m the last one to talk about money. When I was working a “real” job, I was the type to blow through an income that most families could comfortably live on without saving a cent. But finally, at the ripe age of 32, I had this sudden desire to take control of my finances (maybe because they were starting to dwindle). 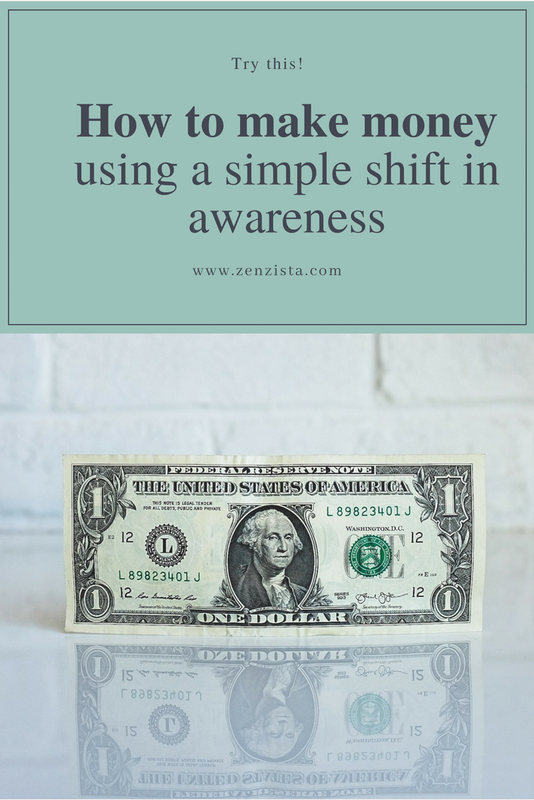 I had this theory that if I just shifted all of my energy into my finances and took the time to figure them out, that I would be rewarded for it. And would you believe that it actually worked? This theory works for anything, really. It’s all about awareness. The more attention you give something, the more it will give back to you. On the simplest level, this theory becomes apparent when you start desiring something, say a new car, and suddenly car ads are leaping out at you on every corner, you happen to meet a car salesman at a get-together or a family member randomly decides to trade up. A simple shift in awareness leads to major manifestation. But back to money. There is a lot of fear in money. It just seems scary. The stock market sounds like a different language, it’s hard to know who to trust and if you’re anything like me, it’s hard not to live by the “can’t take it with you” approach. We’ve lived through one of the biggest crashes in history, so how could we possibly trust our hard-earned money with anyone but ourselves? It’s also really easy to feel like it’s too late, like your younger self has just royally screwed you over and there’s no way out. It’s definitely never too late. Like most things, once you set aside your fear, make a commitment and really delve in to figure it out, it doesn’t seem so scary after all. The hardest part is starting. I’ve seen a lot of saving tips out there like visualization and creating different accounts so it’s not as easy to make transfers, but I think they’re all ignoring the most important thing... and that’s that you have to care. When you’ve got it, it’s harder to care because there isn’t really a problem. It’s a lot easier to ignore the situation and give yourself the “someday speech” over and over. Hidden beneath reasons like “I don’t have time” or “I don’t know how” lies only one thing: fear. Fear of failure, fear of change, fear of instability. Fear is never a good thing to have looming around in your life, it’s a negative source of energy. The first step is to take the time to figure out what you’re really afraid of and what’s holding you back. As Sethi puts it, “fears are just filters that come before any tactics.” Know your worth, because you are worth every penny. I’m not going to sit here and pretend like I’m just rollin’ in the dough. I am, after all, a starving blogger. But my simple shift of awareness did reap a reward right off the bat. It all started with a little magic (I’ll pause here while 58% of the people reading this stop reading). I’m a crystal skeptic myself, but once I set the intention of taking control of my finances, I started carrying my moss agate crystal*, which is said to be good for abundance and prosperity. Within the hour, a friend had messaged me out of nowhere about a paid writing project. Coincidence? Maybe, but I was pretty flabbergasted at the timing myself, staring at the little gem like it had just shot rainbows out of one end. I also, for the first time in my life, felt a sudden drive to delve into my bank accounts instead of the binge-worthy TV show I had been looking forward to all day. This drive led me to do a little research. I was overwhelmed and didn’t know where to start. My sister had told me about that book I Will Teach You to be Rich, but with so many in my queue, the thought of having another book to read almost killed me, so instead I started perusing his site and would highly recommend it as a great first step for anyone. I also, as cheesy as it may sound, asked the universe for help... like, “OK universe, I am putting all of my attention into my finances. Can you please reward me for it?” If you count getting a few hundred dollars back within a few hours, it was a success. I analyzed my bank statements and called Bank of America about a monthly maintenance fee they had been charging me for a year, and they quickly refunded it all just by asking. Another refund I had been waiting on rolled on in. It wasn’t much, but a few hundred dollars without moving a muscle is pretty good if you ask me! From now on, I’ll be keeping up a monthly meeting to make sure my awareness is always on the money. Do you have any financial tips to share? I'd love to hear if these tips and tricks work for you! *Crystal: It doesn’t have to be a moss agate crystal. Here are a few other expert picks: green aventurine, pyrite, tiger’s eye, jade, citrine. Going green is a safe bet. Feng Shui: Make sure the southeast corner of your home is clean and organized. This is the “money corner” in feng shui. Mantra: Repeat the mantra “I am a wealth magnet”... sooner or later, you’ll start believing it.